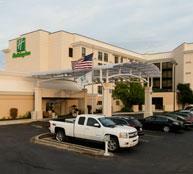 The Holiday Inn Wilmington North Carolina is a full service hotel with brand new rooms that's ideal for business and leisure travelers to the Wilmington, North Carolina area. This contemporary lodging establishment offers 127 spacious rooms, divided into suites, junior suites, and standard rooms with a king size bed or 2 double beds. We are centrally located just minutes away from Wrightsville beach, Downtown Wilmington, and ILM - Wilmington's premier airport. Enjoy new rooms, on site restaurant and lounge, room service, indoor pool, Whirlpool, complimentary airport shuttle and more when you make reservations today.